The team at Sea Road Surgery, from left: Aine Coleman, Dr Carmel Bambury, Dr Aoife Kiely, Dr Fiona Curran, nurse Helen Mathieson, Karen Feeney, and Dr Ciara Glennane. Sea Road Surgery has been providing compassionate, patient centered, evidence-based care to Galway families for more than 30 years. 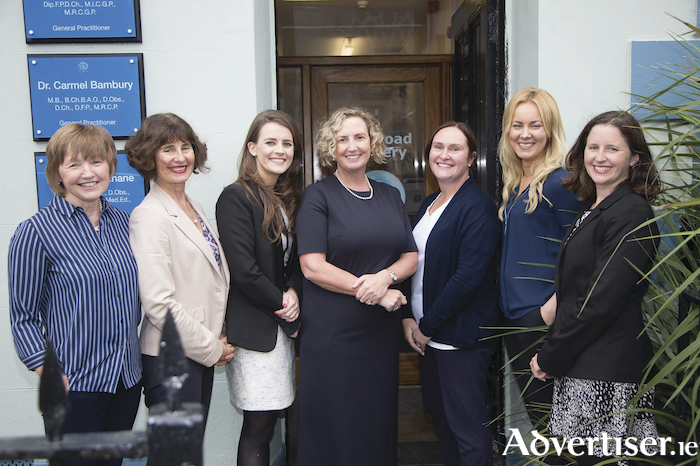 Founded in 1985 by Dr Carmel Bambury and the late Dr Joan Davoren, Sea Road Surgery was the first all-female family practice set up in Galway. Dr Fiona Curran, principal GP, has watched the practice grow and diversify since she joined the team almost 15 years ago. Last year was a difficult year for patients and staff alike with the untimely passing of their much loved and highly respected colleague Dr Davoren. This year has brought more changes with Galway native Dr Aoife Kiely joining Dr Curran and Dr Ciara Glennane in the practice, while Dr Bambury announced her retirement at the end of the year. Practice nurse Helen Mathieson and Aine and Karen at the front desk complete the dedicated team at Sea Road Surgery. Each of the doctors has particular areas of interest, allowing them to specialise within the practice and provide the highest quality of care to the entire family. The team place a great emphasis on preventative medicine and early detection of illness, and to this end provide a wide variety of screening services such as Wellman/Wellwoman assessments, occupational medicals, and fertility and menopause clinics. Sea Road Surgery welcomes all ages and families whether resident in or visiting Galway and look after both private patients and those with medical cards/GP visit cards. New patients are welcome and can book a consultation online at www.galwaydoctors.com or by calling 091 588604.